Private house at Soi Ton Son located is just off Sukhumvit rd. opposite South Pattaya rd. there are a lots of local amenities surrounding the property, local food market 24 hours, shops nearby by walking distance, local school, easy access to main road Sukhumvit rd. The house come with very cozy farmhouse style wooden 2 story wooden house. There are a lot of relaxing space and private garden with BBQ area. Fully furnished with large storage on the 2nd floor. Well-arranged lounge room with sofa TV area and arch leading to semi open plan European kitchen with a good amount of fitted base and wall units, cooking hob with extractor hood above and large fridge freezer, there is also space for dining in the kitchen on the table with 4 chairs. 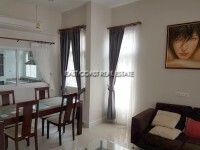 There are 2 bedrooms and 1 bathroom with some utility outside space around the property as well as off street parking. Offered for sale under Thai name for just only 3.5Million baht with Tax & Transfer to be paid by buyer. Also available for rent for minimum 1 year contract.